The names eft and newt both arose from the Old English name for the animal – efte. It became “an eft” or “an ewte” then an ewet was shortened to newt. Both names eft and newt survived and came to note the two primary life stages of the animal – with eft referring to the juvenile (terrestrial stage) and newt, the adult, aquatic stage. There are four regional varieties or races of N. viridescens. The most common (and the one in our neck of the woods is) is N. viridescens viridescens. It ranges from northeastern Canada to the eastern Great Lakes and down the Appalachians and on into Mississippi, Alabama and Georgia. N. viridescens dorsalis, the broken-striped newt is found in the coastal plains of the Carolinas. N. viridescens louisianensis, the central newt is found from the western Great Lakes all the way to the Gulf Coast. And there is a Florida specialty, N. viridescens piaropicola, the peninsula newt, known only from peninsular Florida. It is in the eft stage that our red-spotted newt is most often encountered. This small – 3 to 5 inch salamander – is generally bright reddish-orange with darker red “eye spots” outlined in black. They like the moist forest floor of the Southern Appalachians and may be encountered actively foraging during early morning hours and on rainy, misty days. Last Friday on Locust Creek I encountered at least a dozen of these critters along the half-mile of old roadbed I have to traverse to get to my points. I had to keep an eye to the ground to keep from stepping on them. viridescens viridescens often remains in this eft stage for three to four years (sometimes up to eight years) before metamorphosing into a sexually mature, aquatic adult. Some efts begin to assume the olive green coloration of the adult during the terrestrial stage. Once they become sexually mature they remain aquatic for the rest of their life, which can be around 15 years. The entire order Caudata (basically any tailed amphibian) are known commonly as salamanders. However, today when most people think of salamanders they think of the slimy lizard-like streamside critters like the dusky salamanders and/or the red-cheeked salamanders of the family Plethodontidae. But eastern newts, of the family Salamandridae don’t fit that mold. 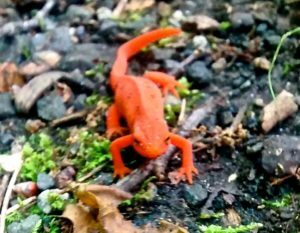 The red eft has a dry rough skin and the skin of the adult newt is slightly moist but still rough to the touch. So, kind of in the sense of frogs and toads – all newts are definitely salamanders but not all salamanders are newts. And that bright color of the red eft, that’s to warn predators that it is toxic. They are not so toxic that you can’t handle them gently, but you wouldn’t want to rub your eyes afterwards without washing your hands first. And you wouldn’t want to injure one by inadvertently stepping on it along the trail – that’s why it’s important to remember to look down.